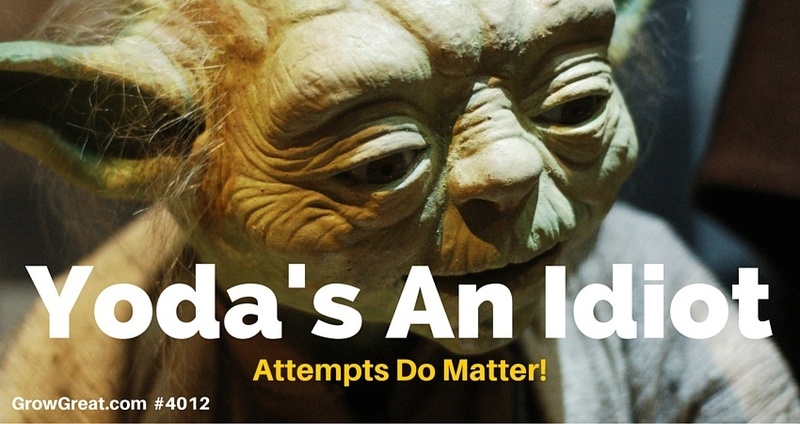 4012 Yoda’s An Idiot. Attempts Do Matter! “Good things come to those who wait.” Many of us have heard that phrase all our lives. It extols the value of patience, but it may also send a subliminal message that overvalues sitting still. And hoping something good comes our way. Millions of people wake up every day hoping something good might happen to them today. Some estimates report that over 150 million Americans play the lottery every year. Millions of people go to Vegas and various other casinos around the country gambling in hopes of some payday. Games of chance provide unrealistic hope for too many Americans. It’s a high risk, low reward behavior…just like waiting for something good to happen. Read Sir Ken Robinson’s books – The Element and Finding Your Element. What we create for ourselves is our own responsibility, says Sir Ken. He’s right, of course. And we know that even if we do sometimes whine and complain about our circumstances. We’re not born with a resume. We create one. Purpose. Meaning. Those are two words you hear quite a lot from Sir Ken Robinson. Who Cares What You Think? How Do You Feel? Brain power is great, but it’s not unique. Neither is data. Or information. Perspective and context is important. So are feelings. Not emotions, necessarily, but feelings. Deep feelings. How do you feel about what you’re doing? Or what you need to do? Don’t think about it. Not too much anyway. Just tap into your feelings. What you feel is necessary. Come on, you know. Deep down you really know. You don’t need me or anybody else to tell you. You’ve done that before. So have I. Welcome to the human race. A premier professional hockey who loves the game he’s played since he was very little finds himself struggling while in his element. Did Benn suddenly lose his skills? Did he forget how to skate well, or handle a puck? We can eliminate injury or sickness. At least this time. Neither of those is hampering him on Sunday. He’s just in a funk. A major league, professional grade mental funk. Watching the game, none of us know what Benn is thinking during the game, but the look on his face reveals how he’s feeling. Bad. Frustrated. Struggling. The announcer’s observation is likely accurate proof that even a top-notch professional athlete can suffer periods of self-doubt and too much focus on what’s going wrong. Jamie will get it turned around. He knows it. His fans know it. He has to do what you have to do when you’re in a funk. Start feeling better about himself, love the process and grab momentum. Can that happen in a flash? Sure. But it may take some time. It does for most of us because we’re not robots. We have to quieten down our head noise and that’s super tough. We have to get in better touch with the feelings that drive us. For Benn, that’s his love and joy for playing professional hockey. It’s the culmination of years of preparation, practice and hard work. He’s a Captain in the NHL. He’s got lots to feel good about…a whole lot less to feel badly about. What do you love? What do you want? Don’t sweat about how it’ll happen. Just go make it happen. You’ll figure it out as you go. Sit back and think. Then think some more. Mind map it. Write out a strategy. Think about it some more. Edit it. Share it. Talk with others. Get lots of feedback. Then go back and re-craft it again. Tell me how you feel after you do all that. I’ll tell you how you should feel. Like crap. Others may tell you how wonderful it is that you’re being so prepared. Or how important it is for you to have these KPIs (key performance indicators). Blah, blah, blah. I don’t care about any of that. Neither should you. Is IT happening or not? If it’s not happening, then what are you going to do about it? Wait and see how things work out? That’s a stupid tactic. And it’s too slow. Instead, grab it. You know how to do that. Grab it anywhere you can. When you’re trying to make it happen you can’t be picky about getting just the right hold. Any old hold will have to do. Maybe you’ll find a better grip later on. Maybe you won’t. But right now, the only thing that matters is that you grab it and hang on. You’re trying to make something happen. Attempts matter. Some weeks ago some jack wagon gets me on the phone and throws some insane KPI out there saying, “This is what success is going to take.” I’m just listening. It’s not my place to talk him out of his expert opinion, no matter how wrong-headed it may be. You’ll find way more pictures of me with my hand over my mouth because I’m a pretty decent listener. I keep listening. He continues to spew forth more idiotic tactical verbiage. As I hang up the phone I realize he’s one of those people who place no value on attempts. All that matters is success. Success is measurable. There’s a KPI for that. He’s wrong though. Attempts count. They matter. I’ve successfully raised kids. I’m watching my grandchildren successfully learn. This movie is happening all over the world in households raising children. Children aren’t succeeding at their first attempt. Some may not succeed after 100 attempts. It depends on what it is. But they’re trying. They’re attempting to learn how to crawl, or walk, or tie their shoes, or ride a bike, or skate. They’re attempting to learn to talk, or sing, or form a complete sentence. Over and over. Day after day. Attempt after attempt. But too frequently we operate with that mindset in our careers and in leading our businesses. Some folks find it gratifying to talk about how winning is the only thing that matters. As much as I push the notion of good execution, life has taught me that good execution hinges on attempts. Depending on where you are along the process, the first attempts might not look very good, but it doesn’t matter. Perfect practice sounds good, but it’s wrong. The first attempts are likely anything, but perfect. Besides, if you could practice it perfectly then you’d have it down and your execution would be stellar. We practice in order to get it right (i.e. perfect). So go out there and take your swings. Give it a go. Make the attempt. Then make another attempt. Ignore people who try to convince you that it doesn’t matter unless you’re winning. They d0n’t know what they’re talking about. They likely haven’t tried nearly enough stuff. My experience has taught me that these same people are among some of the least innovative, creative people, too. I don’t know about you, but when I look back over the most memorable accomplishments of my professional life – I may could even argue that it’s true in my personal life – the biggest ones resulted from me trying something where I wasn’t dead solid sure of the outcome. I didn’t know if it would work or not. Only one way to find out. Try! Yoda’s a moron. There is big value in trying. So think of that big thing – or that small thing – that thing you’re not sure if it’ll work or not, but you think it may. Try it and find out.